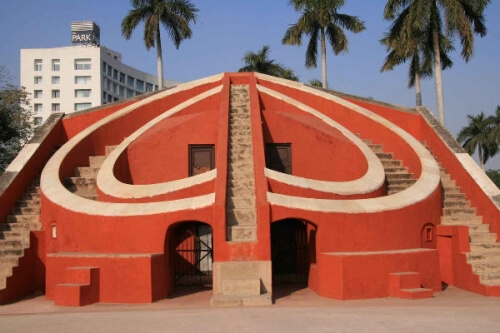 Jantar Mantar Delhi was built by Maharaja Jai Singh of Jaipur in the year 1723. 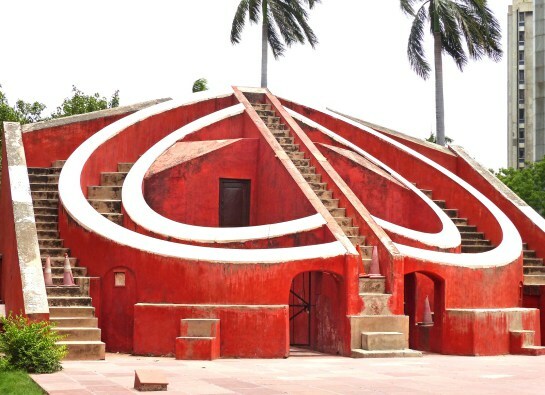 Jantar Mantar is an observatory house present not only in Delhi but also in Jaipur, Ujjain, Varanasi and Mathura. 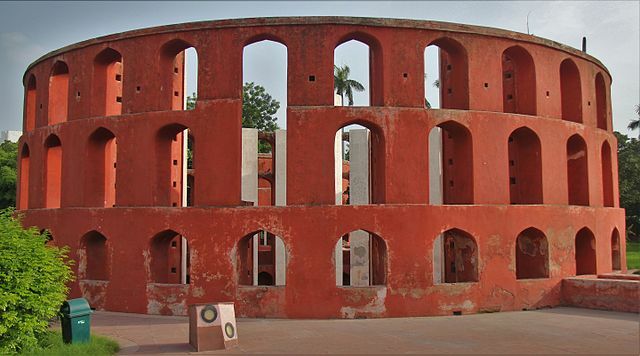 Jantar Mantar is built in brick rubble which is plastered with lime. 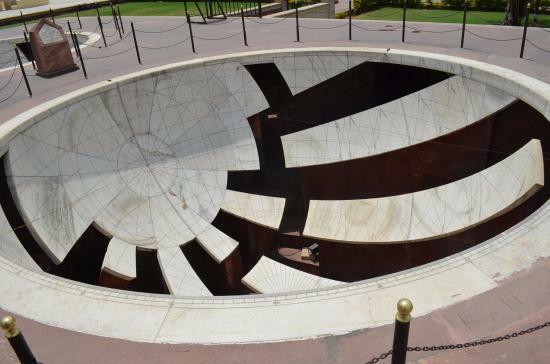 The Jantar Mantar present in Delhi has 13 astronomical instruments which are used to predict the movement of Sun, Moon and Planets. Maharaja was handed over with a task to build and revive the astronomical table and calendar and at the same time to maintain a record of astronomical data and future predictions. 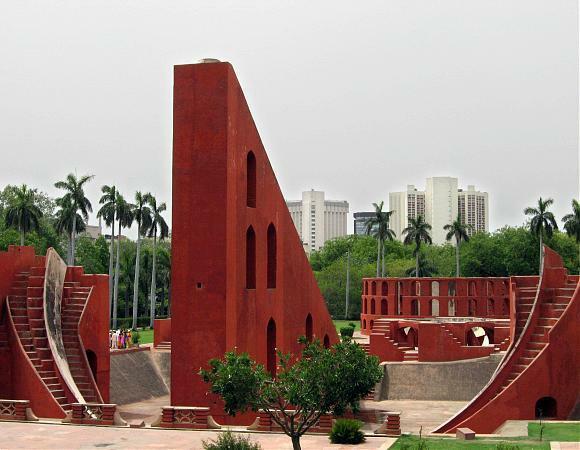 Jantar Mantar means instrument used for calculations. The Jantar Mantar present in Delhi was the first one to build, however the conditions in Jantar Mantar deteriorated by 1867. Later with great effort from the government it was restored back with glory and importance. There are mainly four primary devices here they are Samrat Yantra, Ram Yantra, Jai prakash Yantra, Misra Yantra. Samrat Yantra is also known as Supreme Yantra which is very important in day to day life. It measures the exact time of the day with a difference of half a second. It is 17 ft in height and 114ft long and 10ft in thickness. The Samrat Yantra has an hypotenuse which runs parallel to earth’s axis is 128ft long. On both sides of hypotenuse are the quadrants along with dials which depicts hours, minutes and seconds of the day. This Yantra consists of a pair of cylindrical structures which is facing towards the sky. Each cylindrical structure consists of pillar or pole inside it at the centre. The Ram Yantra is used to for observing the position of a celestial object in the sky by aligning the object with the top of the pillar and the point on the floor. The floor is constructed on a raised platform with chest height and is arranged in many sectors with lot of space between them. This Yantra is the most complicated Yantra built. It is in bowl shape built partly below and above ground. It has hollow hemisphere with concave with some markings on it. The diameter of the rim is 27 feet. Cross wires are stretched between the points of the rim. One can study the position of the celestial object with the help of this Yantra. This Yantra helps in understanding the shortest and the longest day of the year. It also helps in knowing the time at noon at different parts of the world. This is the only instrument which was not built by Maharaja Jai Singh. Jantar Mantar is one of the most important monument well preserved the government. It attracts thousands of visitors every day.